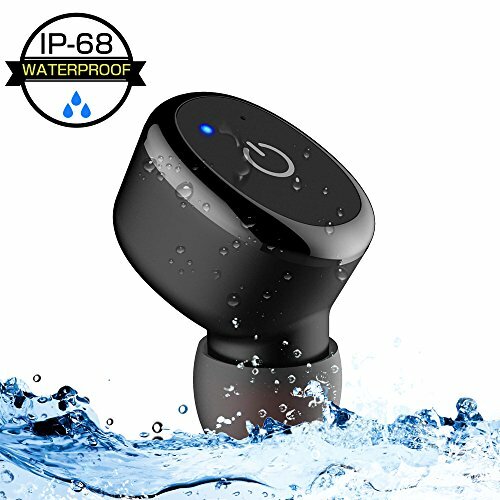 WATERPROOF & INVISIBLE--Exclusive IPX8 waterproof design differentiate it from other normal Bluetooth earbud, allows you to enjoy music and make conversation when showering, bathing, running, jogging, hiking, camping, yoga, travelling and etc. LONGER BATTERY LIFE--It supports up to 5-6 hours of music playing, 6 hours talking time and 120 hours of standby time on only 1 hour of charging. Instantly connected to your smartphone or tablet from up to 33 feet away. At the same time connect 2 mobile phones. MAGNETIC INDUCTIVE CHARGING--Magnetic USB charging is much more convenient and creative than ever - No cable or plug needed. Never Have to fiddle with cords, you put it to charge and pick it up when you are ready to go. HIGH FIDELITY SOUND--With advanced Bluetooth V4.1+EDR technology allows for stable Bluetooth connection, never lose signal when calling, listening music, high definition microphone brings smooth communication.ensures maximum signal quality, and guarantees outstanding sound quality. UNIVERSAL COMPATIBLE--Waterproof bluetooth earbud compatible with all bluetooth devices such as iPhone 5/6/7/8, Samsung Galaxy S5/S6/S7, iPad air, laptop, and other smartphones. MIBOTE provide 90-Day Money-Back without reason, 1-Year Warranty for all of our valued customers! If you have any questions about this product by MIBOTE, contact us by completing and submitting the form below. If you are looking for a specif part number, please include it with your message.